Quietway 2 is one of Transport For Londons flagship new "quietway" routes, running from Bloomsbury to Walthamstow. 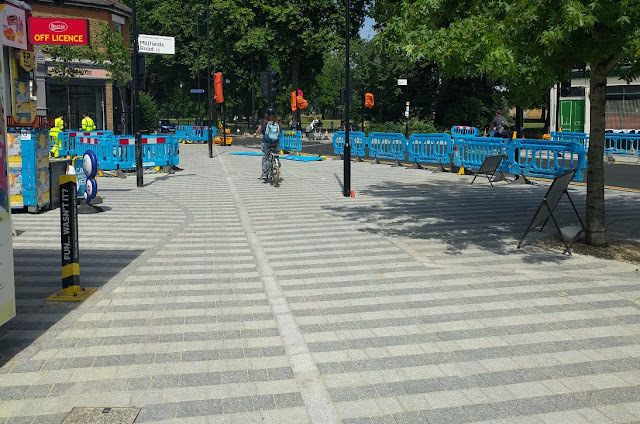 "Quietways are routes that will overcome barriers to cycling, targeting less confident cyclists who want to use quieter, low-traffic routes whilst also providing an environment for existing cyclists who want to travel at a more gentle pace. 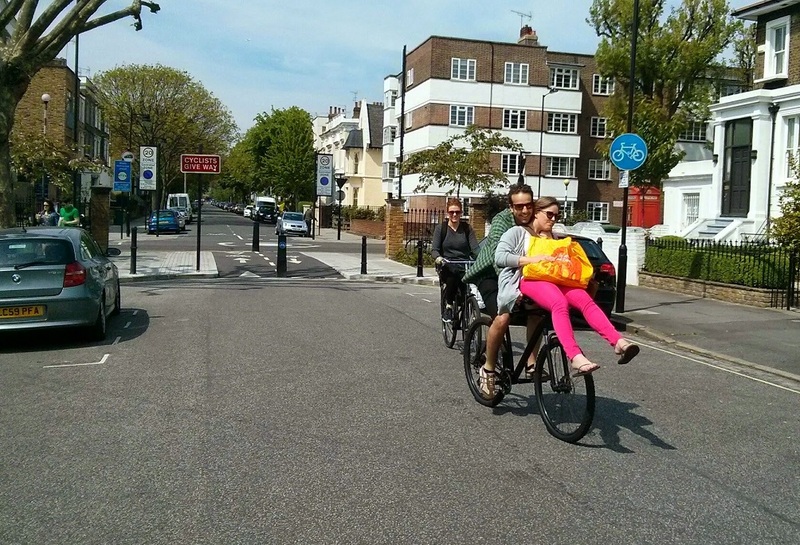 Each Quietway will provide a continuous route for cyclists, linking key destinations following backstreet routes, through parks, along waterways or tree-lined streets." 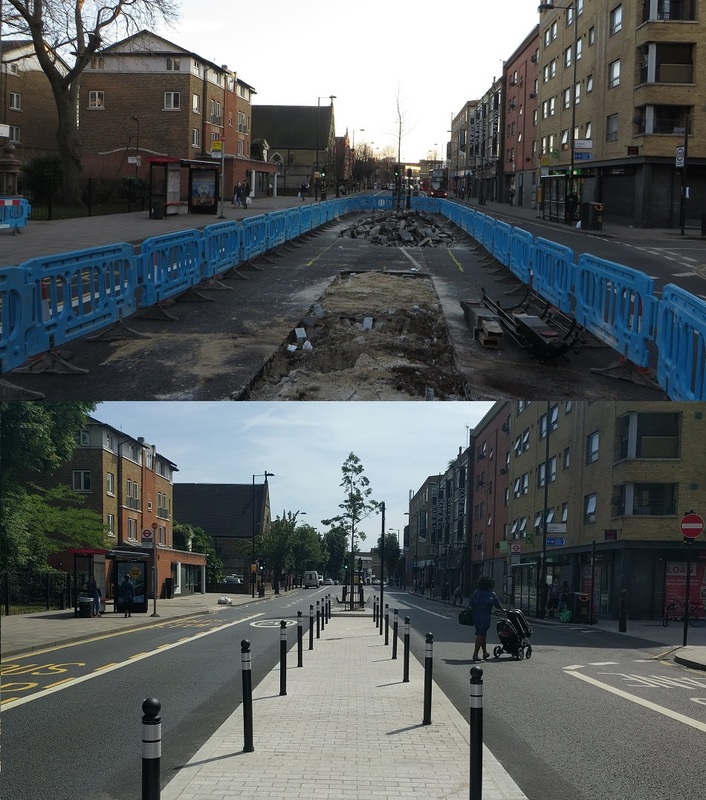 Part of Quietway 2 runs through Hackney and is nearing completion and so I cycled along it this week to have a look. It is disappointing that no plans were considered to redesign this junction and remove the mini roundabout at this junction. Southgate Road is a busy road and I've had vehicles fail to give way to me here on a few occasions, not realising this is a four arm junction if you're on a bike. 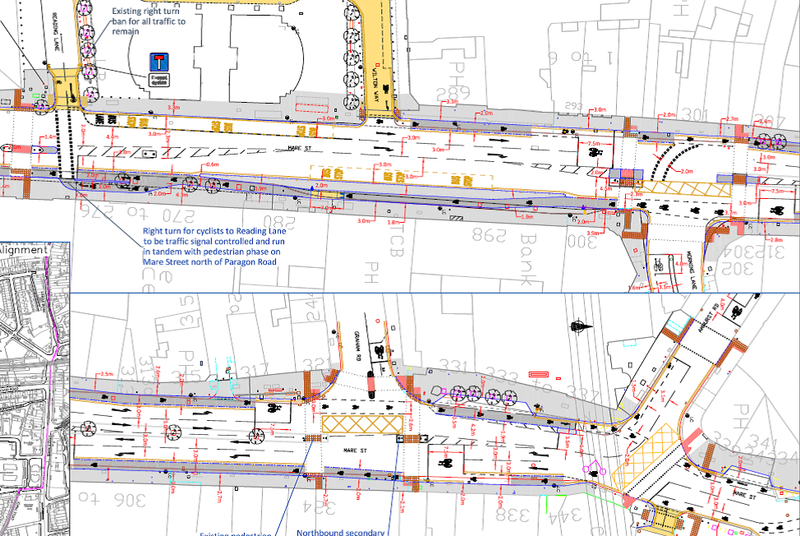 I'm not anti-roundabouts, far from it, but if this route is truly meant to be a high quality cycle route, specifically targeting less confident cyclists, then bicycles should have priority over motor traffic on Southgate Road and a much safer crossing. 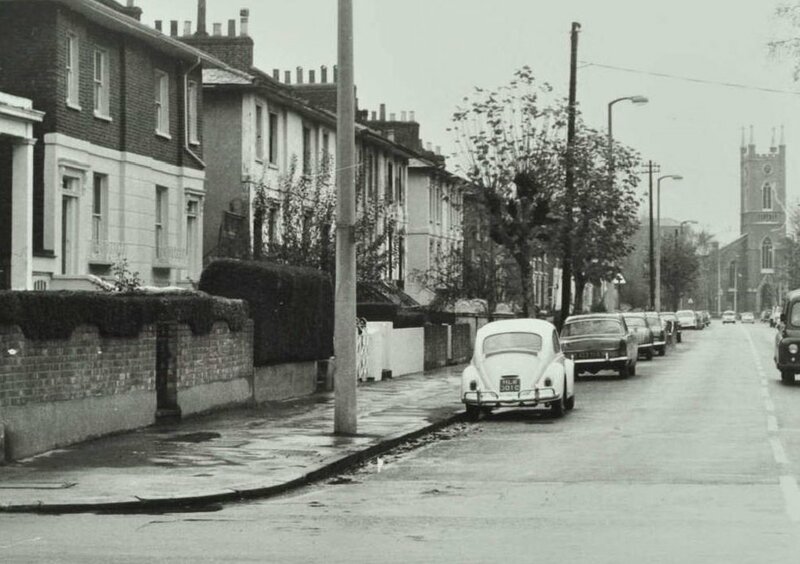 The route continues on through De Beauvoir Town, again no changes were made here as these roads are accessible for motor traffic only by local residents or those visiting, the entire area having been closed to through motor traffic back in 1974, which I've written about previously. It was a really terrible decision as this road is far too busy with through motor traffic that simply should not be here and a shame an 18 month trial to actually be able to monitor traffic and air quality impact was not carried out, as is now happening in the northern half of De Beauvoir Town. The route continues into London Fields along one of the East to West paths though the park. This path used to have a painted cycle lane on it but was removed several years ago when it was resurfaced; I wish they would repaint it to avoid pedestrian / cyclist conflicts, just as they have done recently on the main North to South path through the park. This means that London Lane will continue to be a heavily used rat run as motor traffic uses Mentmore Terrace to avoid the sets of traffic lights on Mare Street (especially those coming from Westgate Street). 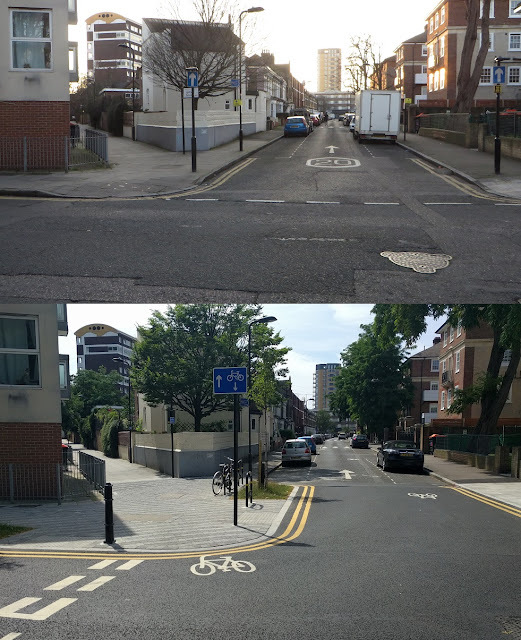 If anything London Lane is now even more attractive rat run as it now has no oncoming traffic, except for people cycling. Meanwhile forcing construction traffic to run left onto Mare Street is surely dangerous when the intention of this scheme is for cyclists to continue straight on to use the refuge island in the middle of Mare Street. Surely the correct thing to do here would be to propose to close the road once construction work is completed and then filter Triangle Road (where a huge amount of traffic on Westgate Street uses it to by pass the Mare Street traffic lights) and then filter Mentmore Terrace outside London Field train station. 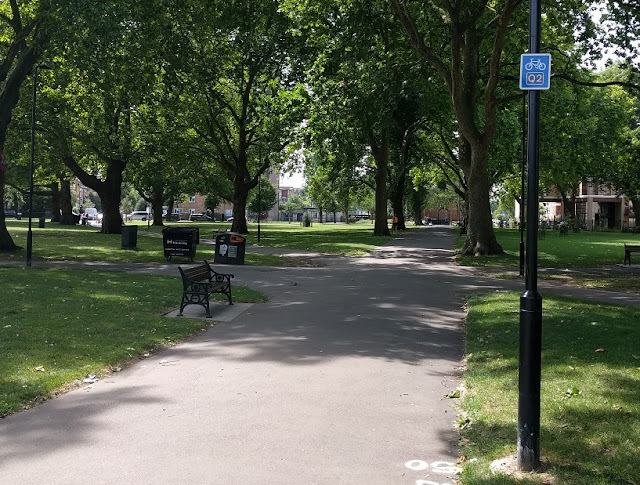 This would ensure the entire area bounded by Westgate Street, London Fields, Richmond Road and Mare Street would be as quiet as the streets of De Beauvoir Town and benefit all local residents. The total amount given to Hackney Council by TFL from the vision for cycling budget for construction of this crossing of Mare Street was £255,000. If you're travelling towards London Fields it isn't really clear that you're meant to turn left down this alleyway, that bike sign painted on the road is the only indicator. I can see anyone unfamiliar with this area and trying to follow Q2 ending up cycling to the end of Brenthouse Road and having to use the bus lane where I was within centimetres of being hit by one of "London's finest" around a decade ago. At the end of the alleyway there are some high rumble strips intended to slow cycles down before the shared pavement but these are real bone shakers, even for myself on a large Dutch bike. 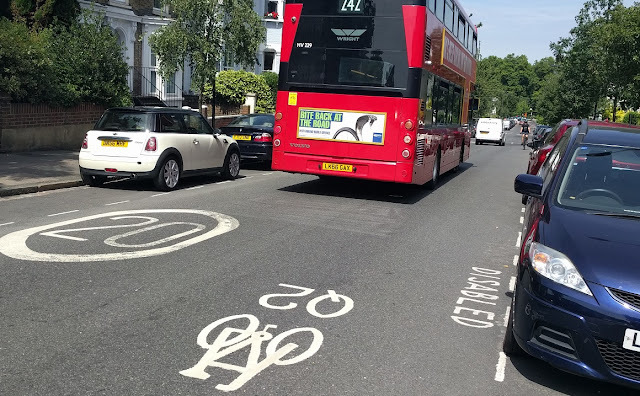 I think they would be too high and difficult for my five year old daughter to cycle over and possibly a real disadvantage for disabled cyclists. 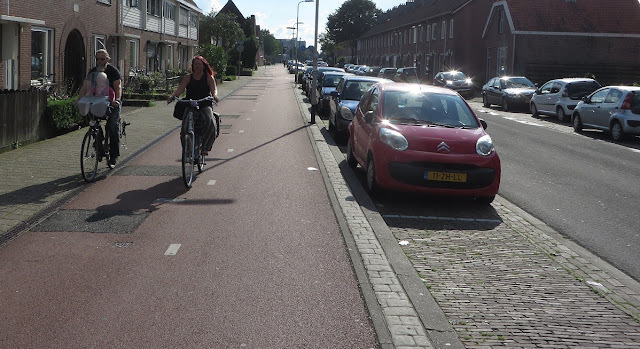 Perhaps a clear cycle path, distinctive from the pavement, would have been a better solution here. This area is currently too busy with motor traffic to be classed as a quietway which is why I'm delighted to see this current proposal from Hackney Council to reduce traffic in the area. Please do respond positively to the consultation. Q2 continues along Chatham Place, which remains two way for all traffic and can be a tight squeeze if all car parking is in use. Let's hope that further traffic reduction schemes are planned for this area and through traffic can also be removed on roads such as Chatham Place and Mead Place. At the junction with Morning Lane a new tiger crossing was consulted on this year allowing people cycling to cross safely into Churchwell Path. This was just an ordinary two-way side road junction before the quietway but now traffic cannot enter from Morning Lane and traffic exiting Morning Lane can only turn right. I must say I'm rather disappointed in how this has turned out. 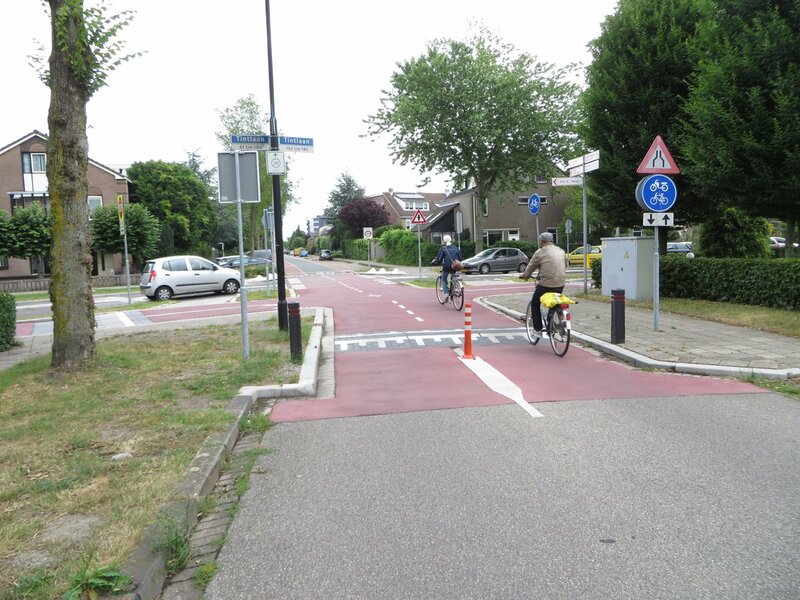 Either have a continuous pavement all the way across the junction or have the cycle lane continue after the tiger crossing and relocate the cycle stand, rather than having one approach for cars and another for bikes. Initially the layout was even worse with a bollard in the middle of the narrow ramp, rendering it useless for many wide cargo bikes. 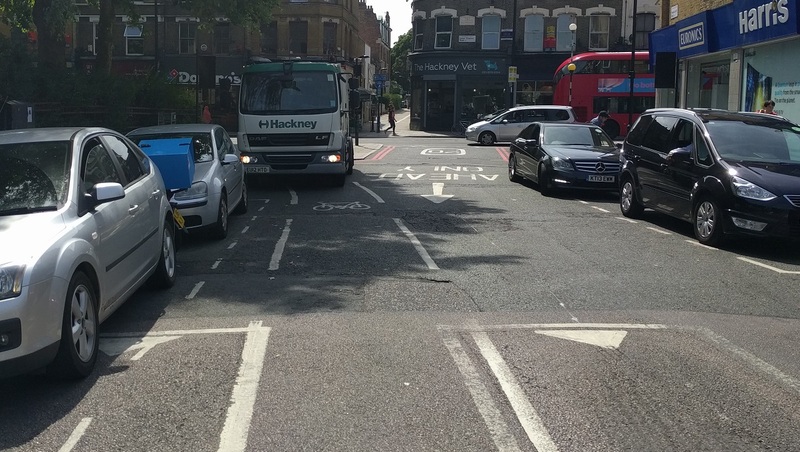 The total amount given to Hackney Council by TFL from the vision for cycling budget for construction of this crossing of Morning Lane was £130,000. Again in my view this is a mistake and may lead to conflict between people cycling and walking. Saying that the path narrows down considerably alongside the church and so the cycle lane would have to end to become a shared path there. The path is well used by pedestrians, especially during the morning rush, so perhaps this was not the correct location for a new major cycle route. At the end of the path there is a fiddly manoeuvre on a shared pavement past "street clutter" as I believe it is called. 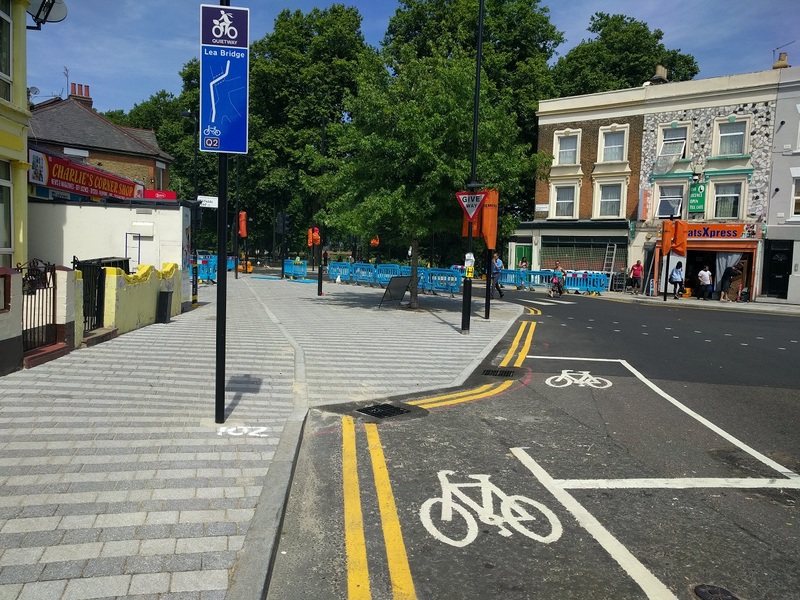 The total amount given to Hackney Council by TFL from the vision for cycling budget for construction of this crossing of Morning Lane was £180,000. 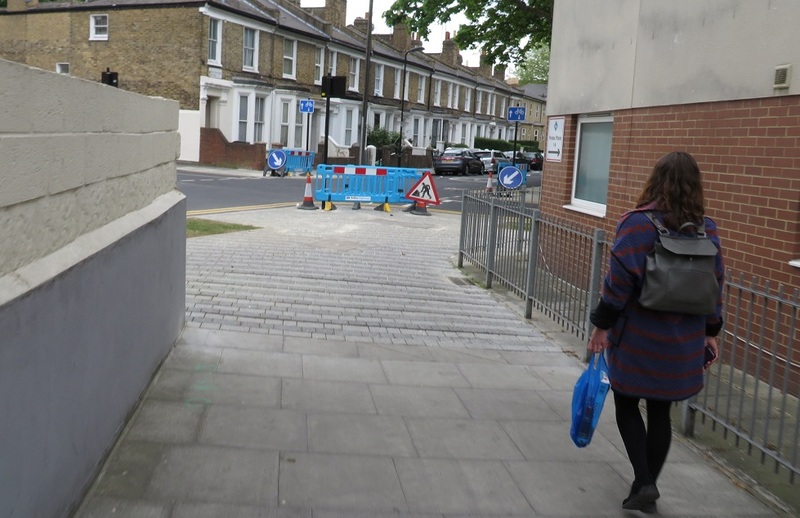 More rumble strips have been added to Clapton Passage (although you can cycle directly down the centre of the path to avoid these) before coming to Lower Clapton Road, a very busy road which carries around 14,000 motor vehicles per day. 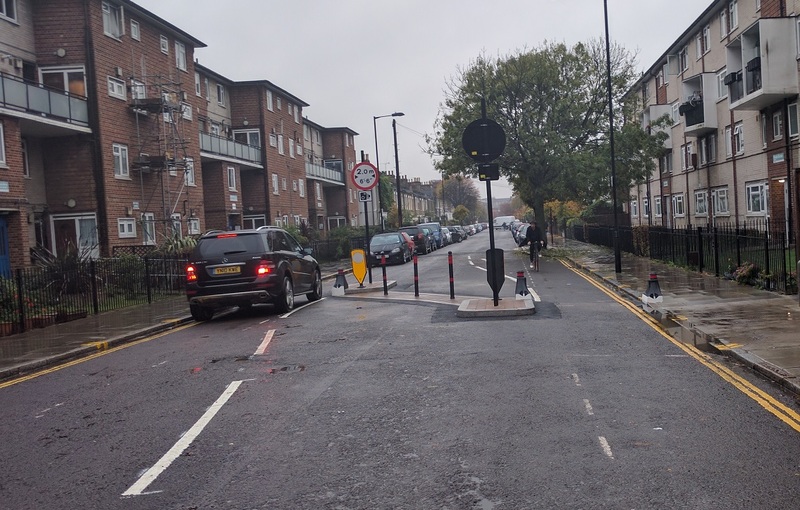 However I find it astonishing that the Quietway hasn't been used to create a crossing here. 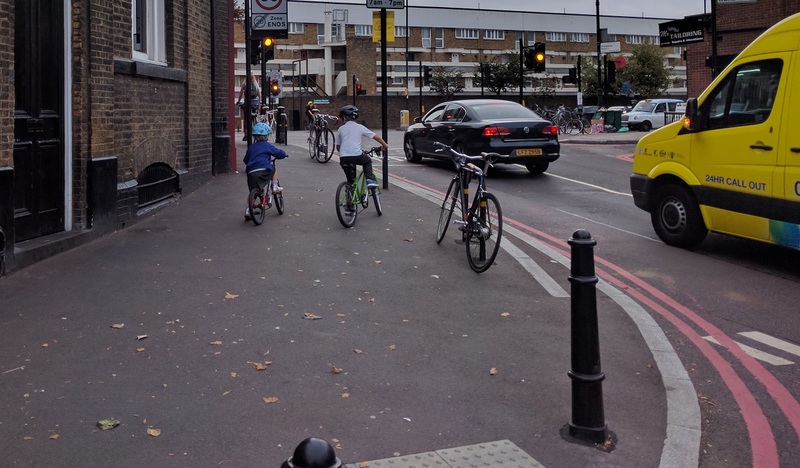 There is a zebra crossing just north of the junction (which some cyclists do use) but this means cycling on the pavement for a short distance and, according to the local police, drivers would "effectively be right" not to stop for young children on bikes and run them over instead. where there is no assistance to help you cross into Clapton Passage across this very busy road. Hardly targeting less confident cyclists! 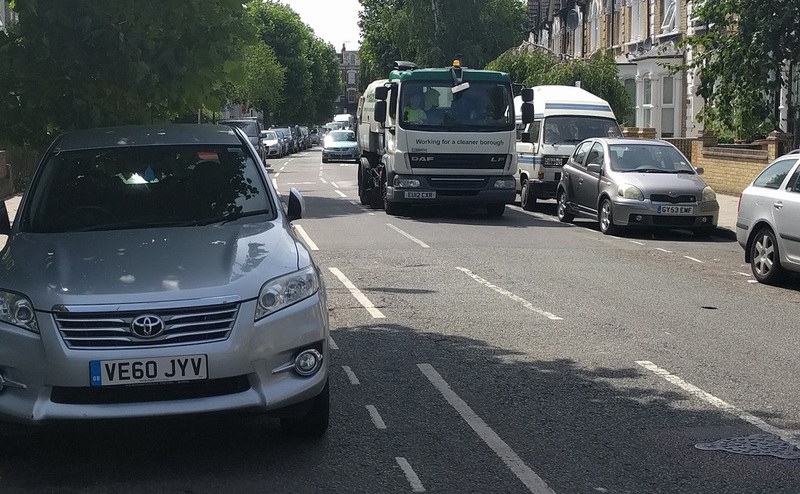 No changes have been made to Powerscroft Road with a contraflow cycle lane in the door zone and mixing it with lorries and double decker buses in the other direction. 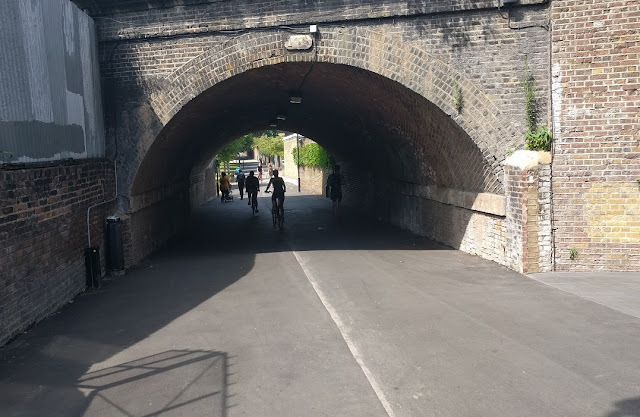 Riding in the contraflow cycle lane can feel pretty scary as vehicles will often move into it to avoid the speed cushions or overtake cyclists coming the other way, leaving inches to spare. 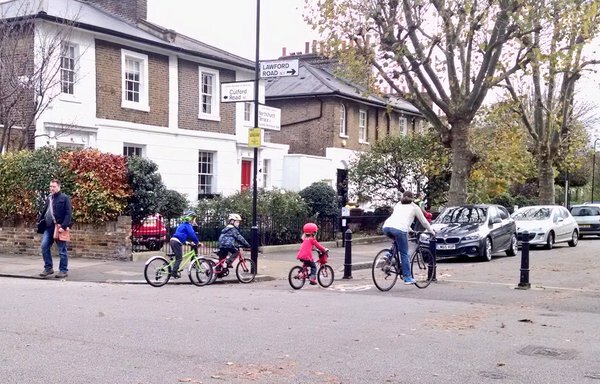 Clearly not suitable for many people to cycle here, especially children. an uncomfortable situation if you're cycling the other way and the car parking is full either side. Hardly a way to "overcome barriers to cycling and attract less confident cyclists"
The cycle lane is really difficult to make out as it is exactly the same oddly paved pattern as the pavement, I don't think I would have even noticed it was there had I not taken a copy of the consultation map along with me. This is a really poor layout both for people cycling and those walking as it pushes cyclists into an area where many pedestrians won't even realise they are crossing a cycle track and could be angry about people "cycling on the pavement"
"working to introduce measures to promote considerate cycling, especially at shared spaces. This proposal will allow confident cyclists to remain on the road whilst less confident cyclists would use the shared space." "Bus journey times will be improved. London buses are very supportive of the proposal a the current junction layout leads to continuous bus journey times. This is because the east-west link is not wide enough to allow two medium sized vehicles to comfortably pass. The traffic signal method of control will run the east and west flows on separate signal phases." 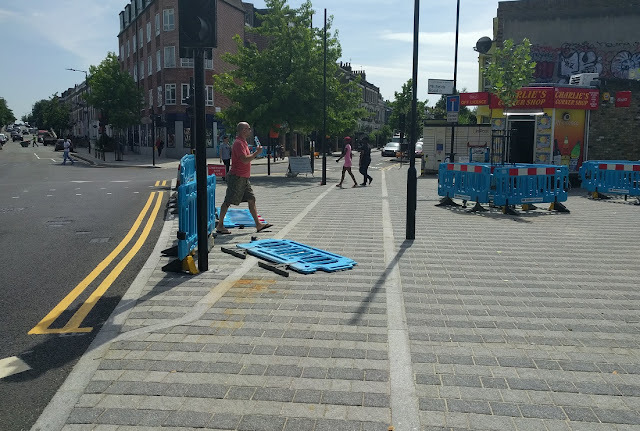 So it seems the removal of the zebra crossing here, paid for from the "Vision for cycling" fund, was carried out to improve bus times in this area. 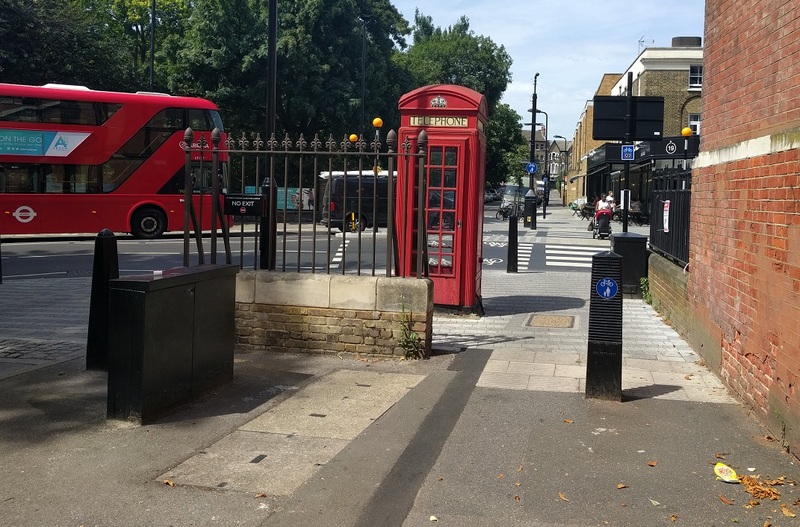 The total amount given to Hackney Council by TFL from the vision for cycling budget for construction of this crossing of Chatsworth Road was £350,000. and replaced by shared space symbols. As well as preventing cyclists from being killed or seriously injured here this could have been the beginning of a scheme to install cycle tracks the full length of Mare Street and on to Cambridge Heath Road to link up with Cycle Superhighway 2, described as a "Top potential connection" in TFLs recent strategic cycling analysis. Instead we're left with a poor, indirect and, in places, unsafe Quietway which is unlikely to attract new cyclists and terrible conditions on Mare Street, which remains one of the unsafest routes for people on bikes in Hackney. I cycle this route from Walthamstow to Covent Garden daily and it's good to have some better crossings but mostly it's the same. 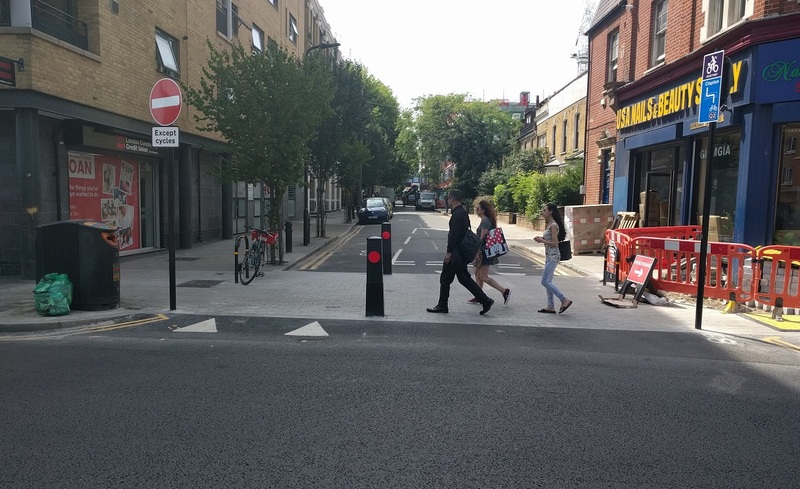 Really disappointed there is no crossing across Lower Clapton Road from Clapton Passage and why have they not upgraded to speed cushions with full length speed bumps, car drivers always go for the middle of the road and this is particularly scary with the buses on Powersroft Road. Really hoping the recent consultation to filter the end of Darnley Road goes through as drivers do not look right and pull out in front of you when I am heading east down Brenthouse Road. Would also like to see traffic volumes reduced on Chatham Place but with people driving kids to school and SUVs and Uber taking tourists to the Burberry Outlet there will always be conflict. I will highlight that although there are problems this section is 10 times better than going down Mare Street. 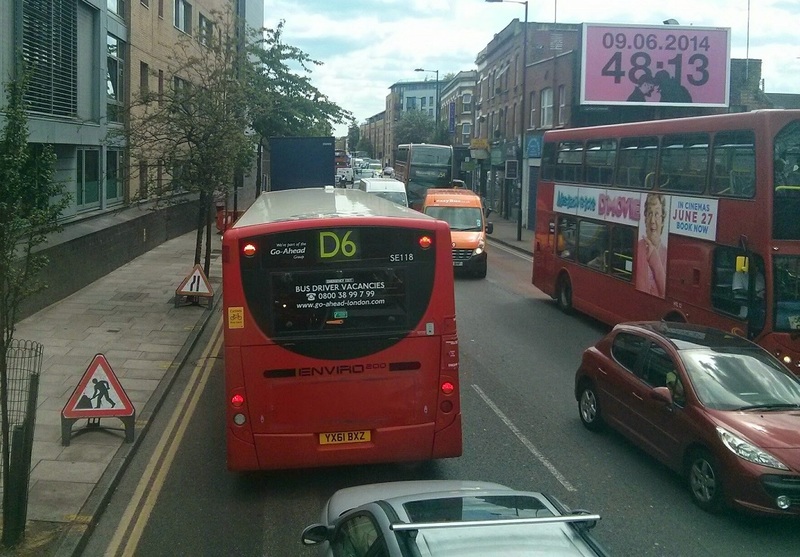 Thank you for writing up on this and keep campaigning for better cycling provision. 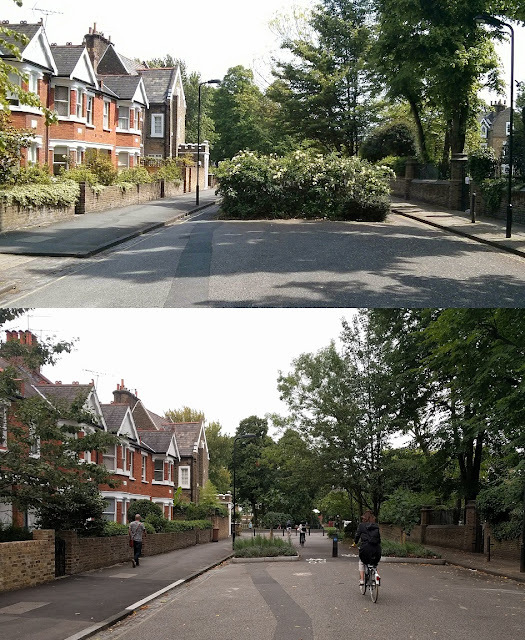 Really wish that Hackney council could make the tiger crossing more obvious to motorists. 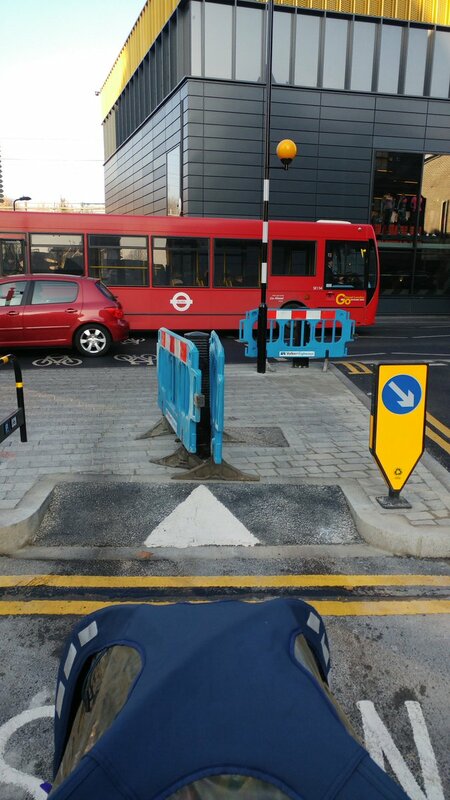 Drivers do not seem to understand or acknowledge that cyclists can cross here. There are have been more than 5 occasions where I have almost been hit by cars who will insist on driving through as I'm crossing because I'm not a pedestrian. It's getting to the point where I feel safer riding through heavy traffic down hackney central than crossing somewhere that is meant to be safe.